10 Back to School Dorm Essentials! I have made a list of what I think are the 10 essential items you'll need for back-to-college time. Heck, these are all great to have for anyone's bedroom room, college or not! 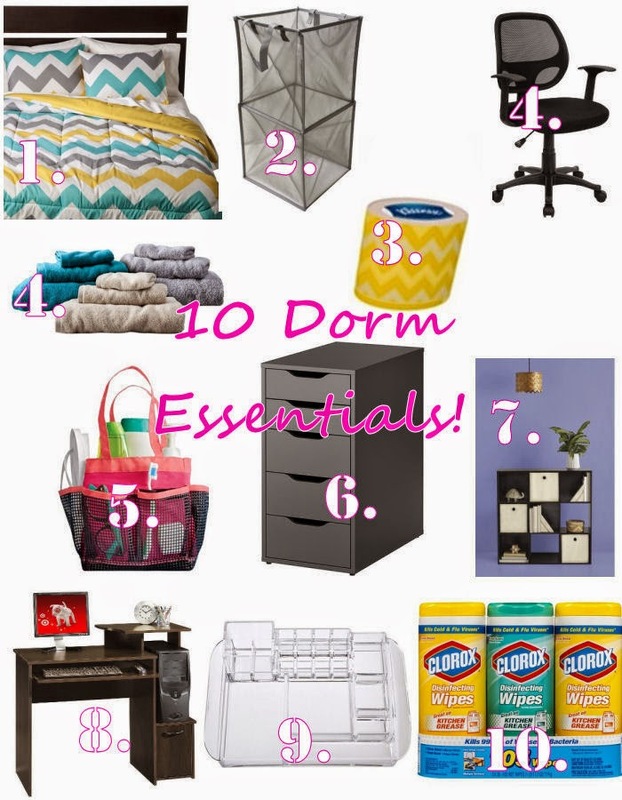 Today I have a list of what I think are the top 10 things you'll need for your dorm room, the definite must-haves! 1. The first thing I think, is something that will make you feel cozy. What better way to bring a piece of home with you than a nice comforter? 2. A foldable laundry basket. Space saving, easy to take along with you when it's time to clean your clothes. 3. Kleenex. So many uses, and they now have cute chevron boxes for a limited time, which would match beautifully with your new chevron comforter! 4. Desk chair. I mean, obviously you're going to need a comfy place to do homework, right? I'm cheating and throwing a set of towels in too, because that's just a given if you're going to be staying at school lol. 5. Shower caddy. This goes hand in hand with the towel thing - you want to keep your stuff together and not lose it/have it in an accessible place where you can just grab it, go shower, and bring it back with you. Even if you're lucky enough to have a bathroom in your dorm, it's still a good idea so that all your stuff is in one spot. 6. Storage! I'm a stickler for storage, and while I don't love IKEA for everything, I am a huge advocate for their ALEX drawer systems. They have different sizes, black and white, and if you buy 2 of them and one of the Linnmon table tops, you can turn the whole thing into a nice desk (if you have the room for it, of course). 7. More storage! The little cube designed storage is always a good idea for tight spaces. You can buy mix-matchy storage boxes for it and really spruce up a small area, while storing a lot of your stuff at the same time! 8. A desk. This is if you have the space, again. However, even a tiny desk is better than nothing - it allows you a space to work/be on the computer without having everything crammed onto your bed. 9. Makeup organizer. Odds are you're going to need something to keep your cosmetics organized, so go for an acrylic organizer with lots of compartments. 10. Clorox wipes. These are good to have no matter where you're living, but back to school time is also cold season, so it's a great way to keep germs at bay and stay healthy! You can use this link to track them down at a Walmart near you! *This post is sponsored by Kleenex and Walmart, but thoughts are all my own!